Lisa Lately: Am I Dreaming of Summer? I'm posting this photo because I want to change some of my photo settings and I can't do that without actually posting one. Or at least, I don't know how to! 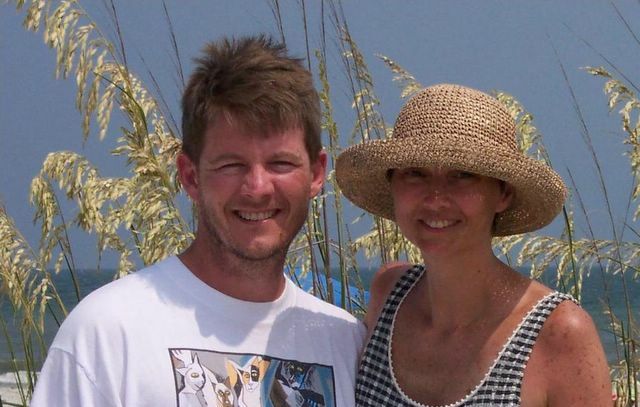 Anyway, this photo of my husband Ron and me was taken on vacation at Hilton Head Island, South Carolina, a couple of years ago when Ron and Brigid graciously agreed to let me take a nostalgia trip. My family used to go to Hilton Head for vacation every year, way back in the days when the island had only a small handful of hotels and not many people. Boy oh boy, has Hilton Head ever changed since I was last there! Way too many people for such a small island. Although I did enjoy revisiting this special place from my childhood, it was not much like my memories and we most likely won't go back.